I love holiday weekends, but it seems that all I do is eat in excess and some of the food is not always healthy. So it's nice to get back to my regular routine of juicing in the morning and eating a big healthy salad for lunch. I pretty much eat this salad, or a combination thereof everyday. For awhile I was stuck on eating tabouleh with hummus, but then I started adding fried pita chips to the mix and decided that eating a salad with a rainbow of colors is a much better choice. My salad always consists of spinach, carrots, red cabbage, beets, zucchini, broccoli and quinoa. I sometimes add baked tofu, regular tofu, edamame, kidney beans, garbanzo beans, or nuts and seeds for additional protein. 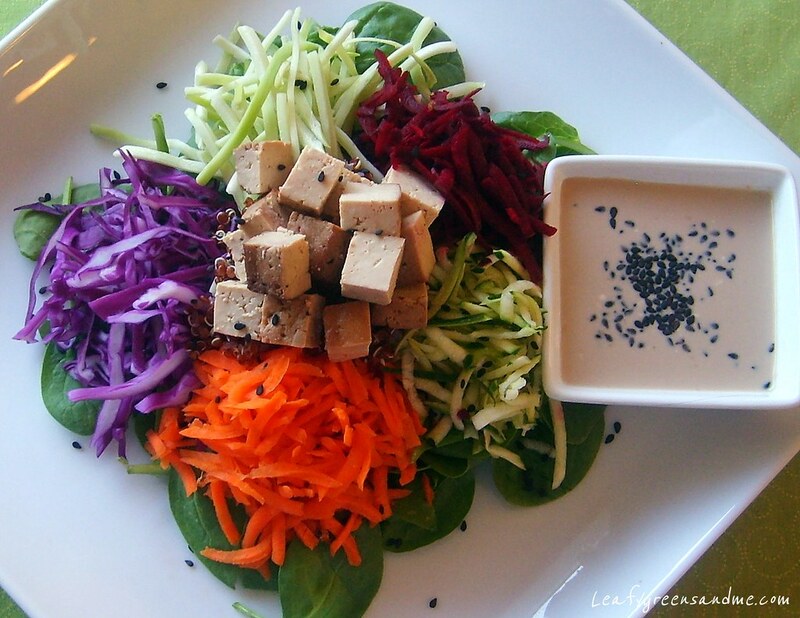 For the dressing, I usually whip up a quick ginger-soy, lemon-tahini or balsamic vinaigrette. I prep all of my ingredients on Sunday and place them in sealed containers in the fridge. Makes it so easy to pack your lunch and go knowing that you're going to eat something healthy and delicious during the day. I just love it!